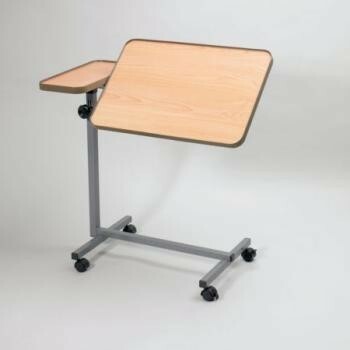 With a large tilting section and a small fixed section for items that need to be kept level, this table is useful in a number of situations. With a large tilting section and a small fixed section for items that need to be kept level, this table is useful in a number of situations. The wood effect, laminated tabletop has an edging strip at the front and the back of the tilting section to prevent items falling off. The small fixed section measures 203×381mm (8×15") and the larger tilting section is 610×381mm (24×15"). Easily height adjustable with a single clamp between 711 and 1118mm (28 and 44"). Weight 9.3kg. The small fixed section measures 203 x 381mm (8 x 15") and the larger tilting section is 610 x 381mm (24 x 15"). Easily height adjustable with a single clamp between 711 and 1118mm (28 and 44"). 102mm (4") underbed clearance required.